This entry was posted in Waste less recipes and tagged experiment, firm tofu, food waste, green, green living, home made, Pad Thai, soy milk, sustainability, sustainable living, Thai, tofu, vegan, vegetarian by Jean-François. Bookmark the permalink. Pad thai! So excited to try my tofu maker (hasn’t arrived yet). Thai food is up there with the world’s great cuisines – and Pad Thai is such a simple but great dish. It’s well worth finding tamarind paste to get the right flavor – and, if you’re not vegan or vegetarian, fish sauce. I’ve made a batch of soy milk with the SoyaJoy (and the resulting okara) and a batch of almond/oat milk. Both turned out delicious! I spiked them with a bit of vanilla cane-sugar sweetener, and the kids devoured. I have an okara cheesecake in the oven. If it tastes at all like it smells, it’s going to be delicious. Crossing my fingers for success…will make for a great DirtNKids post. Cheers! Glad to hear the soy/nut milk was a hit – and really looking forward to hearing how that okara cheesecake turned out. Hope you’ll be sharing the recipe. It’s funny, I’ve had the same thought in the past few weeks, but in reverse. I think we’ll be giving homemade cheese a go sometime soon. You have made me SO hungry. Naughty man! 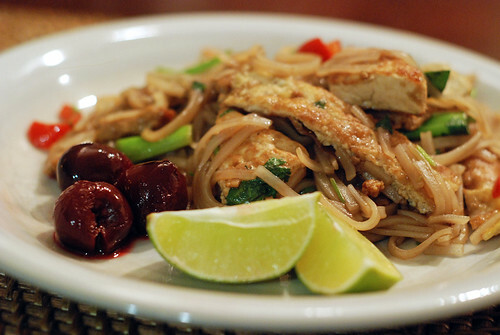 Really, using homemade tofu in a delicious pad Thai sounds heavenly. Do you think I could get away with making my own tofu just using the cheesecloth, without a specific mold, or even using one of the holey trays that you get with pre-packed tomatoes ( I know, I know. I’ll slap myself now)? I must try making my own and seeing how it compares with the locally made stuff I buy (at a hefty price) but I’d like to not buy one other gadget if I can help it. I just wanted to follow up. 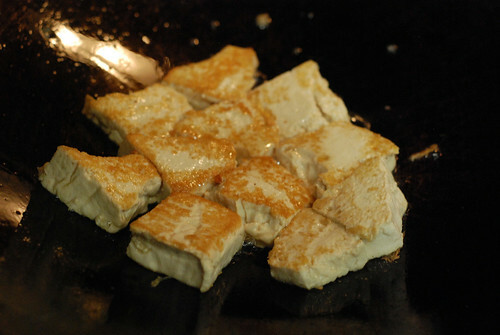 In my research on tofu making, drainage and pressure were the two elements people looked for in a tofu press. 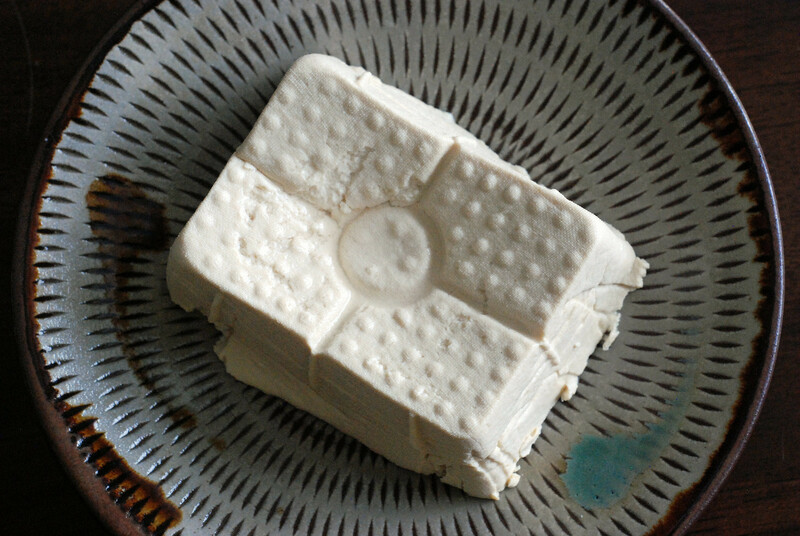 There were some good suggestions for alternative tofu molds, and the most common was to use a the bottom half of a half-gallon milk carton (the wax paper kind) with some holes poked into it on all sides. It seems like a smart way to get shape and drainage while repurposing a carton. You made a very good point in addition to make an interesting dish. You said, ” if you take the time to make your tofu from scratch, you won’t be throwing it away.” Insert anything you make in place of tofu and the world be a much better place. The time it takes to make something invests a few things very important to most people, time and effort. Thanks, Donna. I’m just planning a talk on food waste, and that’s one of the key points I want to make. Once you’ve invested something of yourself in food (whether by growing, picking or preparing it), you value it differently. Looks amazing! Decadent yet healthy, my favorite combination in food. Thai food just generally rocks in my book – all the more impressive given that its ubiquitous fish sauce “tastes like death” (a very accurate recent description by Monti on MasterChef). Thanks so much, I really appreciate it. I definitely want to participate – though I’m traveling for the next month or so, so it may be a while before I get the entry up.